The following screen-shot is taken from the online definition at the Merriam-Webster website. Without empathy, you can’t get to compassion. And without understanding, you can’t get to empathy. You can be the boss without any of these, but you can’t be a leader. Be open and curious to learn because that feeds everything. Without it, you’re destined to get stuck. Growth demands it. Guage how curious and open you are to learn by listening. If that’s a problem, start working to improve that. My best advice is to urge you to consider the high price you’re paying to be the smartest person on the planet. Your ignorance is costing you greater success. If I were sitting down with you I’d be encouraging you to treat yourself better. Take advantage of the collective knowledge of others. Try harder to understand where people are coming from, and why they think the way they do. It doesn’t mean you have to convert, but growth, improvement, and transformation are positive things that will only happen if you commit yourself to learn and understand. Since we’re talking about leadership today, it should be obvious by now that you can’t be a leader (at least not an effective one) without growth. Leaders are dedicated to improvement. First, their own. Then, the growth of those around them. Invest in yourself. Make time to learn, understand and grow. Don’t make excuses. Make time. 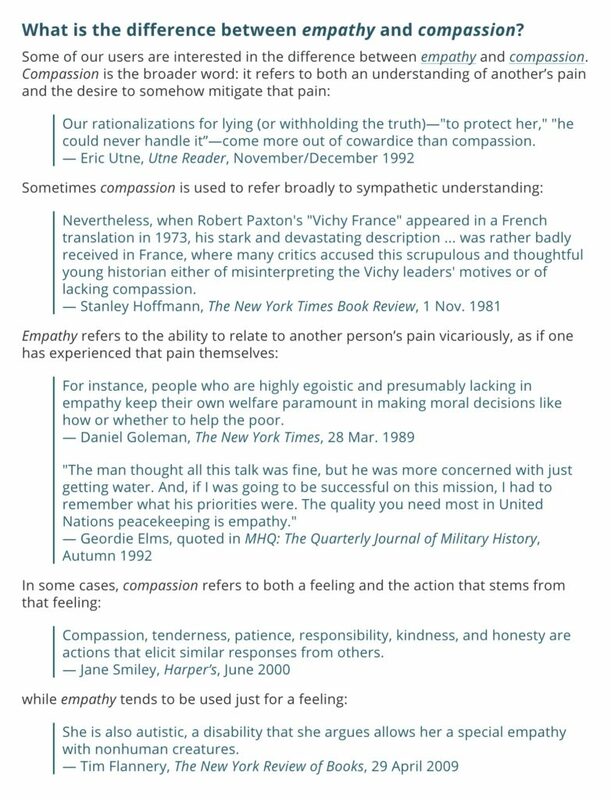 I choose COMPASSION rather than EMPATHY because of those ideas you heard expressed at the Merriam-Webster website. This isn’t my first rodeo. I understood those differences many years ago. Empathy gets all the press though. Business people can get queasy when people start using words like love and compassion. We shouldn’t though because they’re really important words. They’re important actions! That’s right, actions. They’re not merely touchy-feely things. I tire of people slamming emotions. “Don’t be so emotional,” they say. And they’re not referring to an emotional meltdown or an outburst. They’re just talking about somebody who expresses feeling something! It’s ridiculous. Would you rather people felt nothing? We have terms for that. At best, such people would be described as being apathetic. That is, they’re just filled with apathy. They could care less. It’s an appropriate term I think. Because such behavior is pathetic. A-pathetic. At worst, we’d describe them as psychopaths. Is that what you want? To be surrounded by a bunch of psychopaths or people filled with apathy. Boy, that sounds like a high performing team, huh? No, instead companies spend insane amounts of money to measure employee engagement. They spend seemingly less money to do anything about it, which has always baffled me – but that’s likely because the money is in the assessments. “See, here’s how you’re doing.” And we love data. Nevermind that we’re clueless how to make it go up. But I digress. Employee engagement is largely driven by leaders capable of demonstrating compassion. It means employees don’t feel apathy. They’re not psychopaths. They’re emotionally, mentally and physically engaged in the work they’re doing. They feel something positive about who they are, and what they’re doing. Compassion’s role is a top-down deal. It’s not bottom-up. That means YOU have to lead the way. Don’t expect your team members to be engaged, or to exercise compassion with one another (or the customer) if you don’t exercise it first with them. Your organization may experience pockets of it, but it won’t be widespread. And it certainly won’t become the culture of your place. Your organization needs leadership. They need YOU. 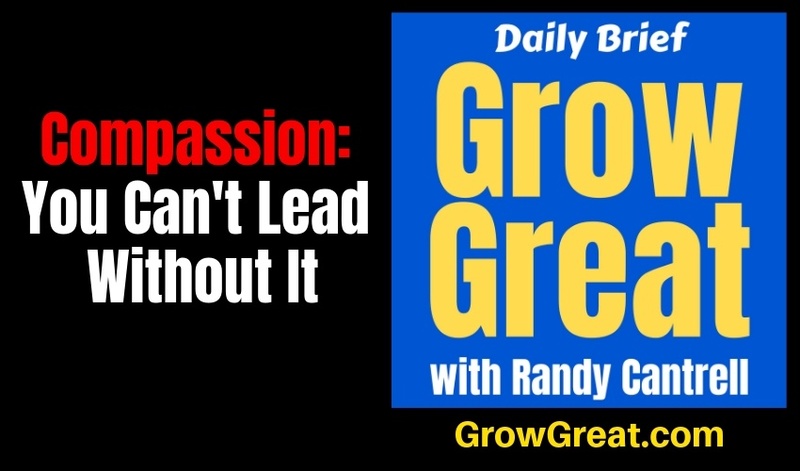 YOU need to learn, understand and grow your compassion. It’ll change everything in your world for the better. I guarantee it.